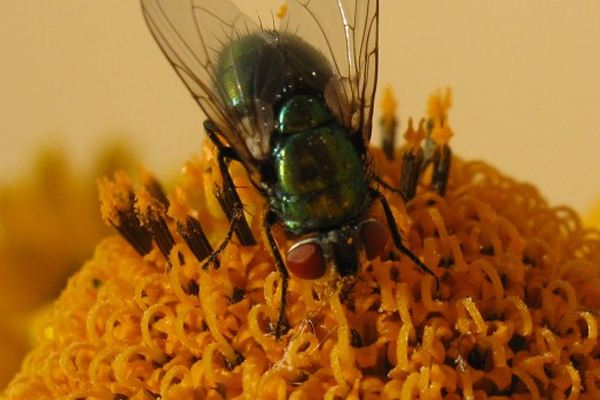 The Calliphoridae (commonly known as Blow or bottle flies have bodies with shiny metallic colors such as bronze, blue, or green. Adult flies are about '/4-inch long. Blowflies will lay eggs on any organic matter, but strongly prefer animal flesh. Eggs are laid in clumps, and a female may lay hundreds in a lifetime. Despite what is commonly thought, meat does not need to be spoiled to attract these flies. Blowflies will lay eggs on freshly cooked meat. In fact, blowflies may even infest the wounds of living animals. Sometimes when animals die in a crawlspace of a home, blowflies may breed in the carcass and the adult flies enter the house. Hatching from an egg to the first larval stage takes about eight hours to one day. 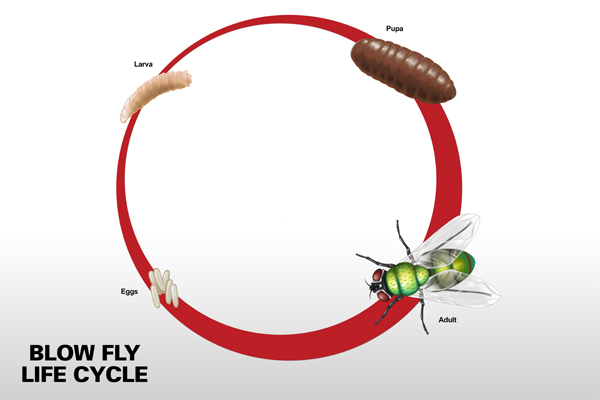 Larvae have three stages of development (instars); each stage is separated by a molting event. The instars are separable by examining the posterior spiracles, or openings to the breathing system. The larvae use proteolytic enzymes in their excreta (as well as mechanical grinding by mouth hooks) to break down proteins on the livestock or corpse on which they are feeding. Blow flies are poikilothermic – the rate at which they grow and develop is highly dependent on temperature and species. Under room temperature (about 20 °C), the black blow fly Phormia regina can change from egg to pupa in 150–266 hours (six to 11 days). When the third larval stage is complete, it will leave the corpse and burrow into the ground to pupate, emerging as an adult seven to fourteen days later.